These Vitra Eames Aluminium Group meeting chairs are a classic Eames design and an original Eames product, made with top quality materials. 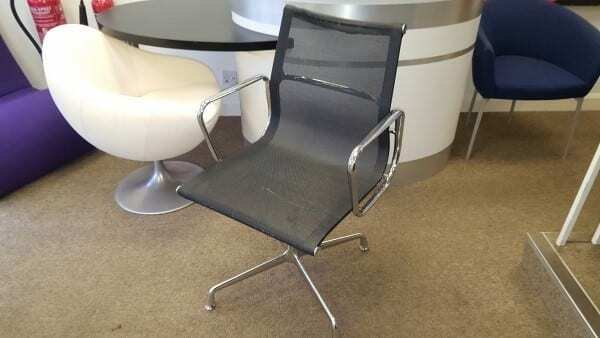 A tasteful and stylish non-swivel chair, finished in black mesh, it is ideal for meeting rooms and occasional use home-offices. View this product in more detail by clicking on the image shown at the top of this page. If you would like to find out any further information about this product, please contact one of our sales team by calling 07944 508282. Alternatively, if you are viewing our website on a Mobile Device, you can click on the Telephone Icon located at the bottom right hand side of your screen. If you are unable to call us, you can enter your details into our ‘Request a Quote Online Form‘ shown below and one of our sales team will be in touch to assist you further. 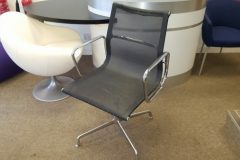 We have many other genuine Eames products, such as the Vitra Cone chairs, which can all viewed in our showroom along with all our other top quality used office furniture.